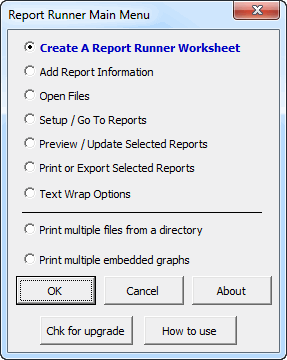 Report Runner is an add-in for Microsoft Excel that prints reports and graphs automatically. It is compatible with Microsoft Excel 2007 to 2019 and Office 365. Barbara Blackwell wrote "The Spreadsheet Assistant and the Report Runner have paid for themselves time and time again. I do a lot of database work and your shortcuts have made Excel infinitely more useful to me. Microsoft's upgrade to Excel 97 was almost depressing when I thought I was going to lose this invaluable tool - I am extraordinarily pleased that your program follows the upgrade. My advice to everyone who uses Excel - buy the Spreadsheet Assistant! Great value saves time frustration and worth every dime. With Report Runner, you eliminate having to go from file to file and remembering what you should print. Report Runner can automatically open workbooks, print reports, and close files. Multiple reports can be printed just by highlighting the desired reports and selecting print from Report Runner's menu. And, Report Runner can save a copy of the reports to an XLS file so that you can e-mail just the reports. The information on your reports is stored in a special Report Runner worksheet. You just select the report and Report Runner fills in the information it needs to store. For example, you may want to print out nine different reports several of which are off of the same worksheet. Without Report Runner you would have to open the files and make any needed changes to the page setup from one report to another. With Report Runner all you do is to select the report descriptions in the Report Runner worksheet and issue the print command from Report Runner's menu. Then, sit back and enjoy!